Two separate buildings at one service area: the hotel is accessible in both directions via a gap in the central barrier, while Peggy Scott's Diner exits to the northbound side only. This is another service area which has had a junction built around it. Originally it was located off a dangerous staggered crossroads junction, with a petrol station (later Texaco) which was built in the late 1970s. This was closed and demolished in the mid-1990s. 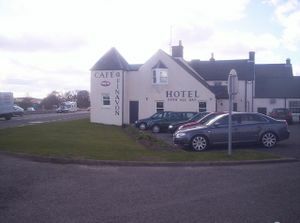 The Finavon Hotel was the ancient Red Lion Hotel/Inn. It has a pub-food menu, and now competes with the main diner. Peggy Scott's is quite a new creation and only opened in about 2003. Before that Peggy Scott herself operated JG's Diner. J.G. were the first two initials of the gentleman who originally set up two restaurants – one at Inchture and the one at Finavon, the Finavon one replacing a building called Woodside. He then sold them in the 1990s to two different owners with Peggy buying this one and continuing to run it as JG's Diner for a few years. The restaurant and the shop for the filling station originally shared the same building until the shop closed with the filling station. In 2002 Peggy Scott then built a totally new building which opened in 2003 as Peggy Scott's instead of JG's. The new building lies just to the north of the old one and is only available northbound. Inside Peggy Scott's is new and clean-looking, and sports a small gift area and a very Scottish menu.